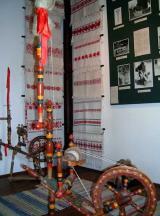 The Village Museum of Cigánd revives the process of how the village became town in the 1920's. The Village Museum is the result of reconstruction. It was originally divided into a room, porch, chamber and was built in the 1900's. Because the yards were too small, the so-called long yards that connected many houses were formed in Cigánd.